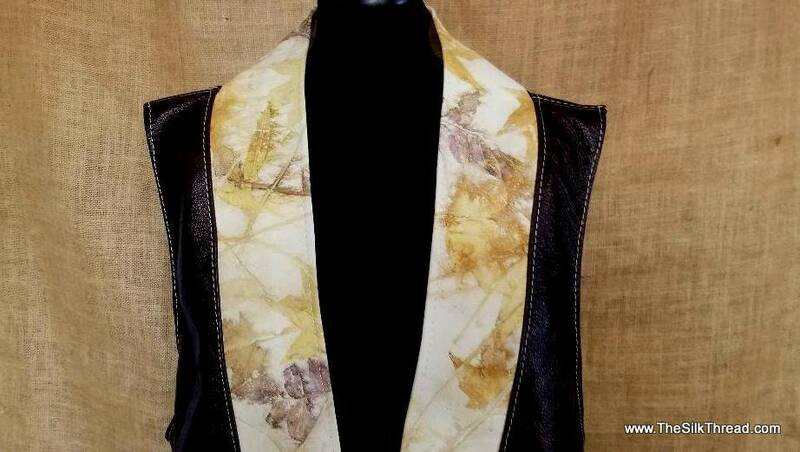 This stunning all leather long vest was created in a rich chocolate leather accented by a beautiful, one of a kind ecoprinted leather facing. The unique design is created at my studio from leaves and plants from my farm. The designs and colors you see are the actual colors from Nature! I designed this comfy garment to fit sizes L to XXL comfortably. Length is a flattering 34" with roomy armholes. The rich deep browns pick up the elegant patterns of leaves from maples, sumac and oaks I used in the process of imprinting their patterns onto the leather. I designed it with no closure as it drapes so well in the front. Topstitched throughout with contrasting thread. You are not investing in "just" a leather garment, you are investing in leather that I designed and created just for this piece! Perfect for layering in the Lagenlook or Boho styles! Leather should be dry cleaned to keep it's soft pliable feel. Totally sustainable, renewable and eco-friendly fashion art. Read my articles on Ecoprinting in "No Serial Number" and "Belle Amoire" magazines!